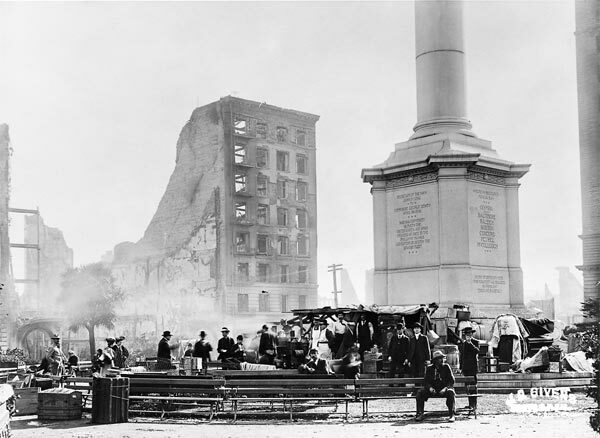 Remembering the 1906 San Francisco Earthquake One hundred years ago, a 7.8-magnitude quake and rapidly spreading fires dealt San Francisco a stunning blow. Those events are remembered through grainy photos, local legends and survivors' letters. 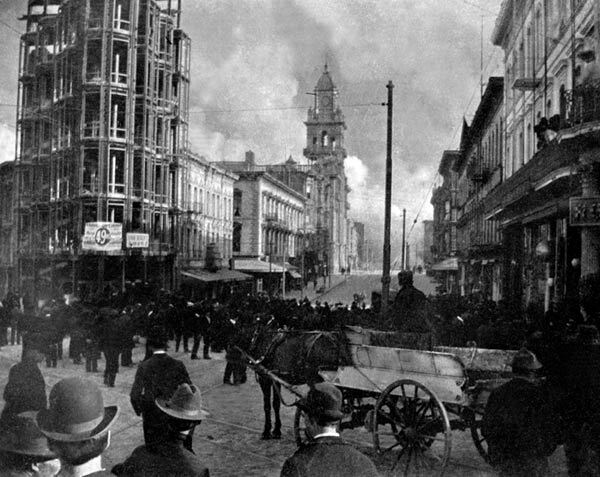 San Francisco was forever changed by the earthquake and fires that struck on April 18, 1906. 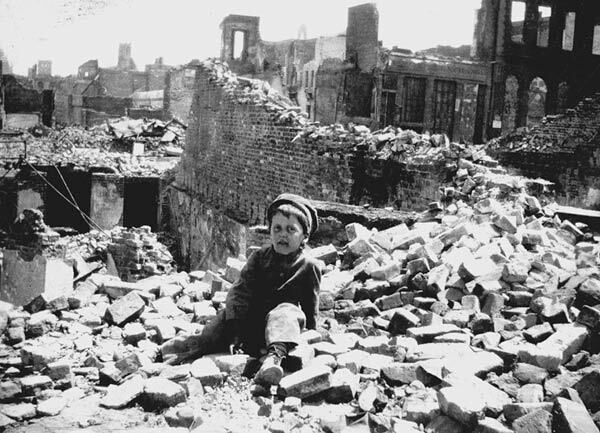 J.B. Monaco, courtesy Richard Monaco Sr.
Dante Monaco, 6, sits in the rubble of his father J.B. Monaco's photography studio on what is now Columbus Avenue. J.B. Monaco's photography studio, on what was then Montgomery Street (now Columbus Avenue), can be seen in the lower right. He took this photo knowing his studio would burn down within a few hours. Fire coming up Kearny Street. Quake-ruptured water pipes left fire crews so desperate that they resorted to using dynamite to try to stop the fires from spreading. But the type of explosive used only made things worse. Many people passed our house with bundles and ropes around their necks, dragging heavy trunks. From the moment they heard that fatal, heart-rending sound of the trumpet announcing their house would be burned or dynamited, they had to move on or be shot. Read more eyewitness accounts of the quake, fires. 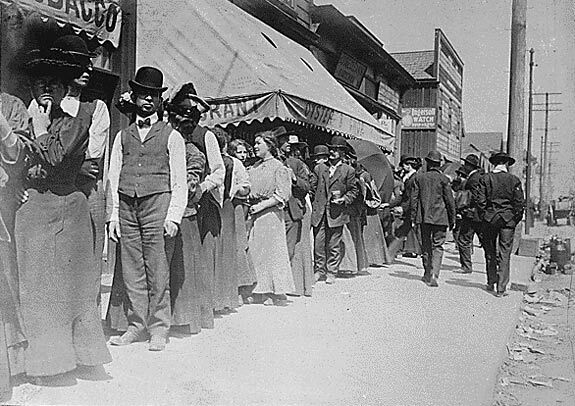 Earthquake survivors wait in a bread line. The fires raged for almost four days, burning more than 28,000 structures and leveling more than three-quarters of the city. 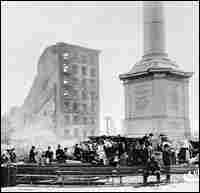 This photo shows the destruction at Union Square. 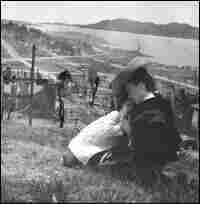 J.B. Monaco's wife Katherine and son Dante on Telegraph Hill after the devastation. The Golden Gate (without the bridge) and Marin County are the distance. Richard Monaco stands near a photo of his grandfather, J.B. Monaco. In the 1970s, Richard Monaco uncovered steel cases behind sheetrock in the family home. 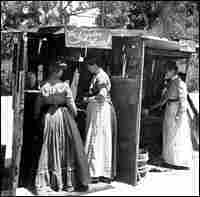 Among the trove were dozens of J.B. Monaco's images and negatives of the 1906 fires. 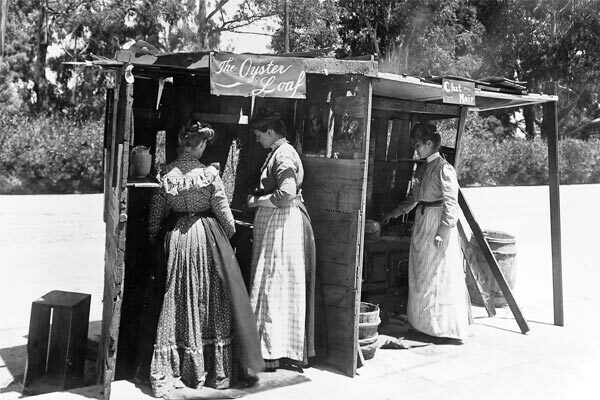 The Oyster Loaf and Chat Noir (Black Cat), makeshift kitchens, set up on Oak Street. On an unseasonably warm Tuesday evening in April 1906, the Grand Opera House in the heart of San Francisco swelled with the voice of Enrico Caruso. 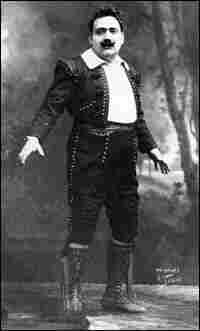 The legendary tenor was performing Don Jose in Carmen with the Conried Metropolitan Opera Company of New York, which was on a nationwide tour. After the performance ended, the finely dressed fans headed home. 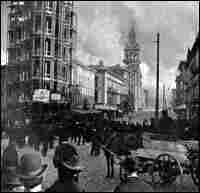 Just hours later, the roof of the Grand Opera House would collapse. Shortly after 5 a.m. on April 18, a 7.8-magnitude quake, unleashed offshore, shook the city for just less than a minute. Later, Caruso would be found collapsed on the ground and weeping in fear among a crowd of shocked survivors in a downtown square. He vowed never to come back to San Francisco -- and he never did. Ironically, before the San Francisco earthquake, the newspapers were headlined with the recent eruption of Mt. Vesuvius, close to Caruso's hometown of Naples. 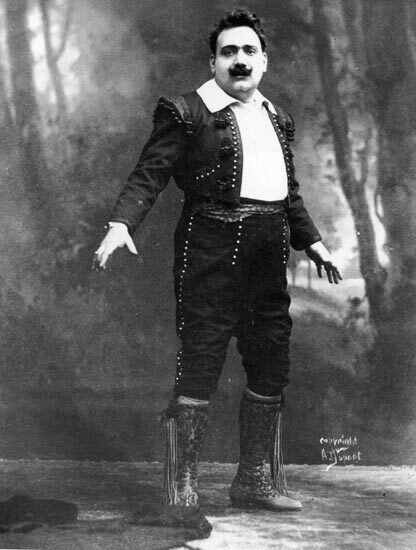 Enrico Caruso as Don Jose in Carmen, ca. 1905. 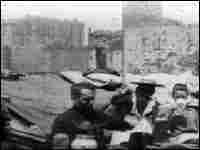 On the eve of the earthquake, Enrico Caruso starred as Don Jose in Bizet's Carmen at the Grand Opera House. Hear a 1909 recording of Caruso's Don Jose performing "La fleur que tu m'avais jetee (Flower Song)." The earthquake resulted in fires that soon grew out of control. They raged for almost four days, burning more than 28,000 structures and leveling more than three-quarters of the city. 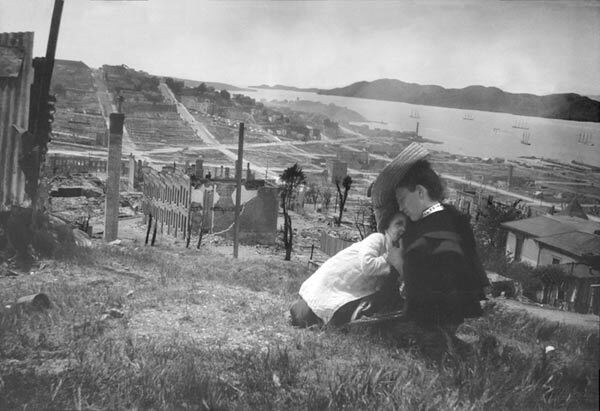 For the past century, a story has made the rounds among the residents of Telegraph Hill about how the Hill was saved from the great fires of 1906. 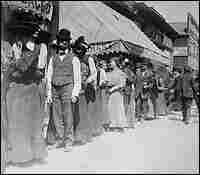 The scene was described by San Francisco writer and 1906 witness Henry Anderson Lafler. Today, those few days in April are remembered through grainy black-and-white images, local legends, family lore and the letters written by the survivors. One eyewitness account by P. Barrett described it this way: "We could not get to our feet. Big buildings were crumbling as one might crush a biscuit in one's hand. Ahead of me a great cornice crushed a man as if he were a maggot." A policeman on duty the morning of the quake likened the ground's movement to a wave in a rough sea rolling down the street. A newspaper reporter described cobblestones popping up and down like popcorn. "The hotel lurched forward as if the foundation were dragged backward from under it, and crumpled down over Valencia Street. It did not fall to pieces and spray itself all over the place, but telescoped down on itself like a concertina." Those who had rooms on the fourth floor simply stepped out onto the street. Those who were staying in rooms on the floors below were crushed. One hundred people may have died in the hotel. In the quiet of the city after the shaking stopped, an even more destructive force was brewing. Much of the water supply came to the city in rigid iron pipes -- and about 30,000 pipes ruptured with the intense shaking. Soon came the smell of smoke. "The firemen were virtually without water. There was very little to do," says Philip Fradkin, author of The Great Firestorms Of 1906. "Now no fireman is going to do nothing. And the first idea that occurred was to use dynamite" to keep the fires from spreading. The city's fire chief was mortally wounded inside one of the city's fire stations, leaving the department leaderless. 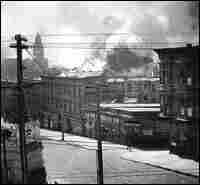 As fires began to crawl across the city, almost 2,000 federal troops arrived on the streets, without martial law ever being declared. Soldiers and firemen began to blow up buildings with gunpowder to create firebreaks. It turned out to be a dangerous miscalculation. "One of the problems was the type of explosives that they used," says Fradkin. "Gunpowder is flammable and spreads fire. And they made the mistake on the end of the second day of dynamiting a huge chemical warehouse… and that was just pyrotechnics plus." The mayor issued a shoot-to-kill order for anyone found looting. Amid the chaos, thousands of residents, dressed in layers upon layers of their best clothes, began making their way on foot to the ferryboats to evacuate across San Francisco Bay to Oakland or to tent camps scattered throughout the city. "Many burned-out people passed our house with bundles and ropes around their necks, dragging heavy trunks. From the moment they heard that fatal, heart-rending sound of the trumpet announcing their house would be burned or dynamited, they had to move on or be shot. As the sun set, the black cloud we watched all day became glaringly red, and indeed it was not the reflection of our far-famed Golden Gate sunset." Most neighborhoods that survived the quake were later consumed by fire. The disaster would leave 3,000 dead, perhaps more. 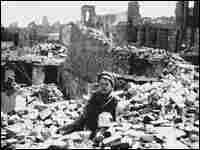 And in a city of 400,000, more than half were left homeless. But that was not the fate of the Filbert Steps of Telegraph Hill, a neighborhood now famed for its lush gardens and roving parrots. Today, it is still accessible only by steep wooden stairs. Aaron Peskin is a resident of the Filbert Steps, where the homes are renovated with beautiful views of San Francisco Bay. One hundred years ago, it was a working-class neighborhood of Irish and Italian immigrants. "The fire stopped totally and utterly just a few hundred feet from where we're standing," says Peskin. "The story of Telegraph Hill is a story of a community who banded together with buckets of water that they had saved, with barrels of wine that the Italians were fermenting in their basements, and poured that on the fires that swept up the other side of the hill." Wine was even used to soak burlap sacks to cool down the roofs of houses. "In those days, many Italian immigrants fermented wine in their basement and there are stories of old-timers getting them out and pouring them on the fire," Peskin says. Much of the disaster and its aftermath is remembered through photographs. Richard Monaco's father was six years old at the time of the quake. 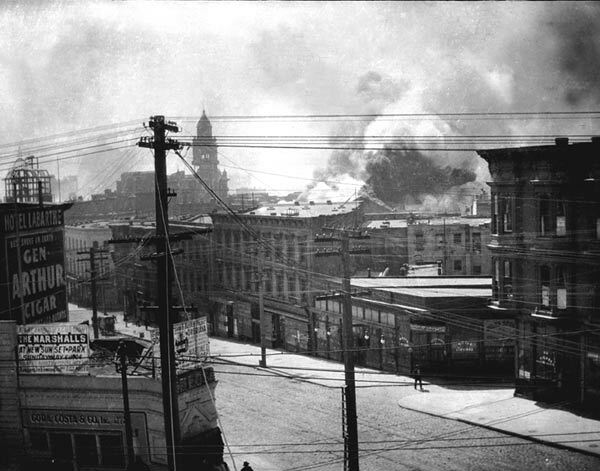 He has 50 photographs that his grandfather took as fires raged through the city. 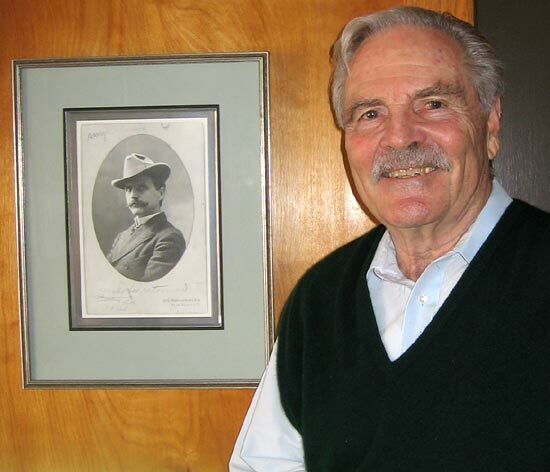 Richard Monaco's grandfather was J.B. Monaco, known as the dean of North Beach photographers. North Beach then was a lively Italian enclave. In the 1970s, Richard Monaco uncovered steel cases that had been his grandfather's, sealed up and forgotten behind sheetrock in the family home. Among the trove were images and negatives that Richard Monaco had never seen before of the fires as they burned up the city. After he found the collection, he built a darkroom in his house. "Taking these negatives, making a print, and seeing San Francisco history evolve in front of my eyes, it was kind of a magical moment," he says. While Richard Monaco's grandfather was taking pictures, his other grandparents were fleeing to the biggest refugee camp in the city along with his mother, who was four years old at the time. "My mother's family, they suffered terribly. Their house burned down. She lost two infant siblings to diphtheria -- two four- or five-month-old twins died within a few days of each other. Their names were Frank and Frances, a boy and a girl. I remember her mother talking to me more about the earthquake and fire... She said, 'I hope you... never experience anything like that in your lifetime.'" As the ashes cooled, the city immediately began to rebuild. Nine years later, San Francisco hosted a world's fair called the Panama Pacific International Exhibition. It was built on filled-in mudflats. The centerpiece was the 43-story Tower of Jewels, covered with more than 100,000 dangling glass beads. In the evening, all lit up, it looked an awful lot like a brilliant fire. This story was produced by NPR's Cindy Carpien and Melissa Jaeger-Miller.